This guide is for the NES port. For the original version of this game for MS-DOS and SNES, see Mario's Time Machine. Mario's Time Machine is an educational platformer originally released for MS-DOS and then for the NES and SNES. The Software Toolworks both developed and published the MS-DOS and Super NES versions in 1993, while the NES version was developed by Radical Entertainment and published by Nintendo in 1994. The MS-DOS version was re-released as Mario's Time Machine Deluxe in 1996. 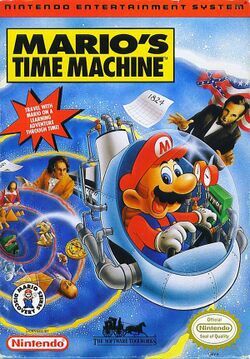 Mario's Time Machine is one of several educational Mario video games that were released during the early 1990s; the game focuses on teaching human history. While the gameplay and engine varies between the three different versions, the story is roughly the same: the player assumes the role of Mario, who uses a time machine to return various artifacts, which had been stolen by Bowser, to their correct points in time. This page was last edited on 3 August 2012, at 07:34.